The production version of the Mission E electric car will launch in 2019. Porsche expects it won't have any trouble meeting the EU's next round of CO2 emissions reduction targets because more than half of its sales by 2025 will come from electrified vehicles. The European Commission has proposed a 30 percent reduction in fleet CO2 emissions from new cars by 2030 – equating to less than 67 grams per km when expressed under the outgoing NEDC testing cycle. Half of that must be achieved by 2025 as an interim milestone to guarantee progress. "Technically we certainly won’t struggle with that [target]," said Porsche development chief Michael Steiner, when asked about the new emission cap. Porsche is taking a much different stance from the rest of its German peers. The lobby organization VDA has called into doubt whether the targets were even reachable, saying it was "more than questionable from today's perspective." In an interview with Automotive News Europe, Steiner was more concerned that politicians might regulate combustion engine cars out of existence, as some lawmakers have proposed. Steiner wants Porsche's lineup to be so attractive that owners will flock to its electrified models, while still allowing purists the chance to buy conventionally powered Porsches. "Customers should be the ones to decide," he said, adding the result of the emissions targets should not be to favor one technology over another. "The attractiveness [of Porsche's electrified lineup] should lead to a powertrain mix that ensures we are compliant," he explained. So far Porsche is confident that customers are slowly starting to migrate towards its more eco-friendly range. The ongoing discussion about diesel city bans is encouraging buyers to switch and go straight to an electrified vehicle to ensure access years from now. Roughly two thirds of all Panameras sold in Europe come with a plug-in hybrid powertrain. Porsche plans to add at least one additional battery electric model by 2025 in addition to its upcoming Mission E to help achieve its target of selling more than half of its cars with an electrified drivetrain. As part of its electrified future, Porsche will start sales of the 600-hp Mission E electric sedan in Europe in 2019 and in late 2019 or early 2020. An electric Macan "could be a possibility for us," Porsche Cars North America CEO Klaus Zellmer told Automotive News earlier this year. Porsche's Strategy 2025 business plan aims to change its image from producing thirsty vehicles to building eco-friendly sports cars, especially given the success enjoyed by Silicon Valley rival Tesla in the highly lucrative 911 market of California. 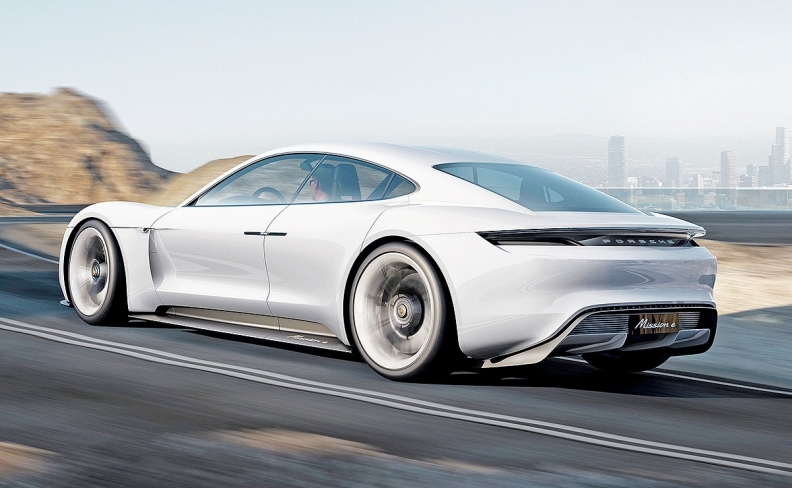 In an interview published in November, Porsche Finance chief and deputy CEO Lutz Meschke said that the carmaker was investing more than 3 billion euros over the next five years to push electrified cars. "By the middle of the next decade we want by and large to be electrically powered," he said. "At least 50 percent of our sales volumes should come from plug-in hybrids and battery electric vehicles like our upcoming Mission E."
This could include the next generation 911. Porsche's most important model in terms of image has thus far reduced CO2 emissions by switching from naturally aspirated to turbocharged six-cylinder engines during the mid-cycle facelift. But the replacement, due to be presented in the third quarter of next year, has been designed to accommodate a small plug-in hybrid drivetrain in the hopes that battery technology will eventually catch up. Changing the proportions of the vehicle were considered taboo. "If we do a hybrid then naturally it has to be very dynamic – the priority is not how far its electric range extends, rather it must bring an advantage in terms of performance," he said. "It's more a question of the right timing." To encourage 911 fans to make the switch, company sources have suggested it could likely be the top-of-the-line derivative, much like the Panamera Turbo S E-Hybrid for Porsche’s sedan family. This would position the 911 plug-in as a kind of 'affordable' version of the ultraluxury 918 Spyder, whose dual powertrain helped it gain the lap record on the Nuerburgring Nordschleife. When asked about the second EV in store by 2025, Steiner did not confirm an electric Macan but said Porsche would not go with another sports car. "We're starting with a sporty four-door concept in the Mission E positioned between the 911 and the Panamera, so it's logical that we will look to balance our lineup with a product in a different segment such as an SUV," Steiner said. He expected the electric SUV could have a range of more than the 500 km that the Mission E will have. Steiner said customers might also be offered a choice in the future between batteries with different electric ranges. That way those looking for a sportier dimension could avoid a dramatically heavy drive, and instead stop more frequently to recharge.